A noisy loud air conditioner can be an annoyance especially when sleeping or watching TV. Not all air conditioners are made equal when it comes to how much noise they make. Some are so quiet you don’t even know it has turned on while others can wake you up in the middle of the night. Before racing out to buy a new air conditioner lets look at somethings a home owner can do to quiet down a noisy A/C unit. The moving parts of an A/C unit is what makes them noisy, mainly the compressor and the condensing fan motor. 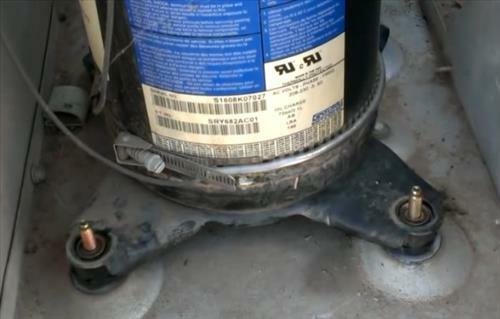 The compressor is what pumps refrigerant through lines to remove heat and can sometimes can be loud. There is what is called Compressor Sound Blanket Wraps that go around a compressor helping to muffle the noise that they make. Most A/C units dont come with a noise suppressor blankets but a few manufactures do install them at the factory. Be sure to check if one has been installed already or not. Installing a compressor blanket is not hard but does require removing a side panel or the top panel to get access to the compressor. 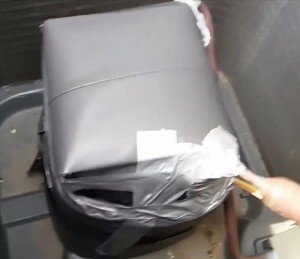 A compressor blanket is made of a thick noise suppressing material and simply wraps around the compressor and can greatly reduce the noise they make. Some compressors vibrate when they run making them loud as they vibrate around. A cheap way to fix this problem is with vibration isolation dampener mounts which are nothing more than hard rubber fittings. 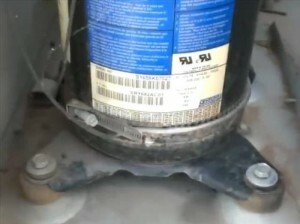 The dampener mounts are placed under the compressor were it is bolted to the unit, usually 3-4 bolts. Dampener mounts are very effective if a compressor is vibrating badly. Installing vibration mounts is not difficult, but does require opening a unit and replacing each compressor bolt with the rubber vibration dampener ones. If you go this route be sure to get the correct bolt size. There are many sizes and styles to chose from. A condensing fan motor is a large fan that blows heat away from a A/C unit has it runs. These motors can make a rackety noise or a loud buzzing noise if they don’t fit in the unit properly. Sometimes this is due to bad manufacturing or when the unit was shipped somehow tweaked the casing the motor sits in. A good HVAC technician may be able to replace the fan motor and get it to seat properly getting it to quiet down. Often the compressor motor itself is simply bad and has worn bearings making it spin unevenly. Condensing fan motors are a job that a handy Do-It-Yourself type of person can do. 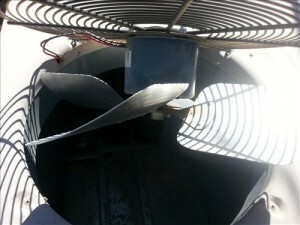 Read here for more on replacing a condensing fan motor. Another problem with a condensing fan is if the fan blade itself has become damaged making the motor spin wobbly and creating noise. Fan blades and condensing fan motors can be bought on Amazon or eBay. If you do order the parts be sure they match your unit. This post is not meant to replace a certified HVAC technician. If you do not have the proper training be sure to call a qualified HVAC technician.